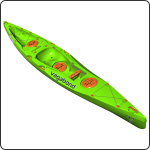 While smaller children will find this kayak large to paddle and manoeuvre, it is suitable for older children and teens. The Tankwell is a great spot for your dog. On flatwater, the Marimba is fast. It offers both speed and comfort for a full day out on the water. A great boat for touring with speed, comfort and sufficient storage space for multi-day trips. If angling is your sport, we recommend the Marimba Angler version. 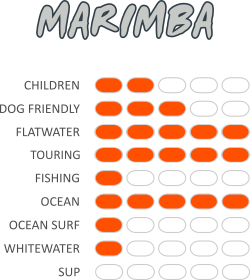 The Marimba has the right pedigree to perform on open water and ocean. The speed, stability and manoeuvrability allows it o surf ocean swells as well. Although the Marimba will get you out through the breakers and back in to shore in style, it wasn’t designed to cutback or ride tubes. Enjoy trip on rivers with small rapids and scenic flatwater sections. This kayak is not optimal for big water and large rapids.